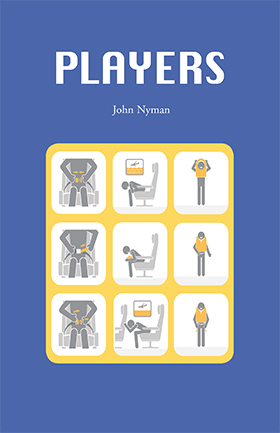 The last thing in John Nyman’s debut collection Players is an artifact (dare I call it a poem?) called “Desk Index”: a 10 page list, double-columned, of seemingly random items. In it, you’ll find letters, words, abbreviations, acronyms, and any other typographical unit you can think of, all arranged in alphabetical order. Like a proper index, it comes after the notes and acknowledgements. It was the first thing I noticed when I fanned out my copy of Players. I didn’t know what the hell it was until I turned back to the notes section—-that ubiquitous road map in every contemporary poetry collection. The reader is told that “Desk Index” is “an alphabetized list of every occurrence of every textual phrase printed or inscribed on an item on or in my bedroom desk on the date of collection, August 6, 2013.” It’s a remarkable and strange document of hyper-obsessiveness, of dogged arrangement. All 18 occurrences of “2” are listed. We find, on only the second page of the piece(! ), both “60930-1” and “60950-1.” There are hundreds of entries. Now, I still can’t decide if these ten pages are a waste of the publisher’s nicely textured Zephyr Laid paper, a barbaric yawp from the Google mind, or something in between. Nyman is surely goofing a bit, poking fun at the earnestness of the avant-garde stunt. Who knows. The reader of Players is often unsure of the rules. The poems are purposely shifty, but they’re also technically sound and sonically brilliant. Nyman’s forebears are varied—there’s late Ashbery here mixed with a vowel-rich Bökian twostep. His poetic also features the complex rhythms and polysyllabic internal rhymes of contemporary hip-hop. In “For MF DOOM”, Nyman skillfully mimics this master’s complex flow.